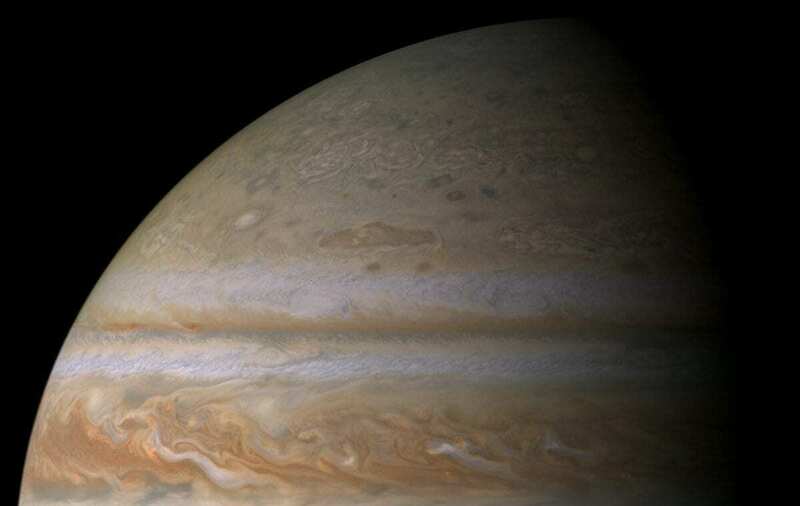 Twelve new moons orbiting Jupiter have been found -11 “normal” outer moons, and one that they’re calling an “oddball.” This brings Jupiter’s total number of known moons to 79. Various groupings of Jovian moons with the newly discovered ones shown in bold. The ‘oddball,’ called Valetudo after the Roman god Jupiter’s great-granddaughter, has a prograde orbit that crosses the retrograde orbits. By Roberto Molar-Candanosa, courtesy of Carnegie Institution for Science. Because of their sizes–one to three kilometers–these moons are more influenced by surrounding gas and dust. 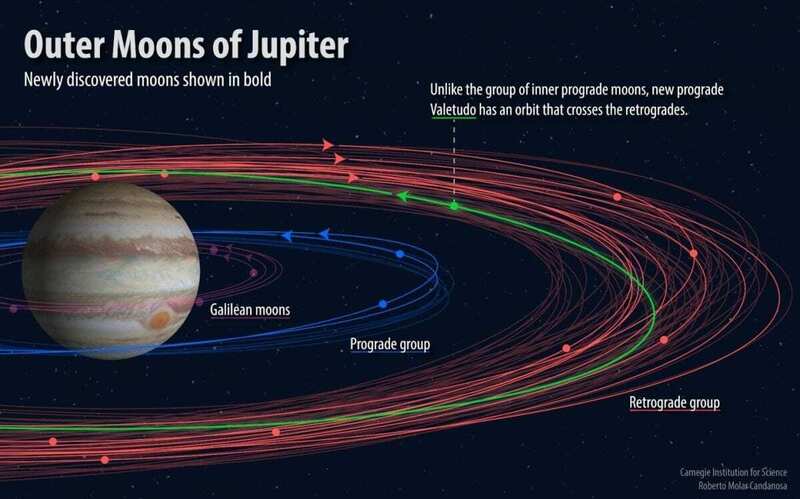 If these raw materials had still been present when Jupiter’s first generation of moons collided to form its current clustered groupings of moons, the drag exerted by any remaining gas and dust on the smaller moons would have been sufficient to cause them to spiral inwards toward Jupiter. Their existence shows that they were likely formed after this gas and dust dissipated. The initial discovery of most of the new moons were made on the Blanco 4-meter telescope at Cerro Tololo Inter-American in Chile and operated by the National Optical Astronomical Observatory of the United States. The telescope recently was upgraded with the Dark Energy Camera, making it a powerful tool for surveying the night sky for faint objects. Several telescopes were used to confirm the finds, including the 6.5-meter Magellan telescope at Carnegie’s Las Campanas Observatory in Chile; the 4-meter Discovery Channel Telescope at Lowell Observatory Arizona (thanks to Audrey Thirouin, Nick Moskovitz and Maxime Devogele); the 8-meter Subaru Telescope and the Univserity of Hawaii 2.2 meter telescope (thanks to Dave Tholen and Dora Fohring at the University of Hawaii); and 8-meter Gemini Telescope in Hawaii (thanks to Director’s Discretionary Time to recover Valetudo). Bob Jacobson and Marina Brozovic at NASA’s Jet Propulsion Laboratory confirmed the calculated orbit of the unusual oddball moon in 2017 in order to double check its location prediction during the 2018 recovery observations in order to make sure the new interesting moon was not lost.